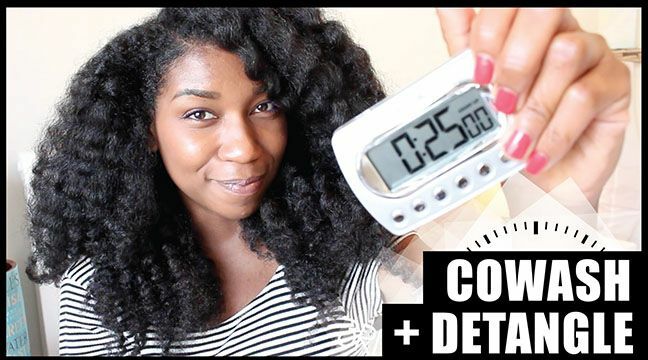 Naptural85 Detangles and Co-Washes...In Under 25 Minutes? Separate your dry hair in two sections, bunning one half out the way. Cover your hair in Trader Joe’s Tea Tree Tingle Conditioner from ends to roots. Do not attempt to run your fingers through your hair. Use the palms of your hair to spread the product, very similar to the smoothing method. Secure the section with a ribbon tie and repeat steps 1-3 to the other side. Release one section and rinse out the product under the shower stream while fingerdetangling. Separate half of that section and apply more Trader Joe’s Tea Tree Tingle Conditioner. Detangle with the shower comb from ends to roots. Repeat the process with the top section. Coat the entire section with aloe vera juice. Seal with the Naptural85's DIY Hair and Body Oil. Twist the section and bun or pin away. If you want an overnight treatment or you are too tired, cover your head a plastic processing cap, leave the mixture on overnight, and rinse it out in the morning for supreme moisture. To prevent the plastic cap from slipping off, wrap a long sock around your hairline to catch any product that may run down your face while sleeping. After securing it with a sock, cover your hair with a satin bonnet or satin scarf. For even more security, put a t-shirt over your pillow. How do you keep your detangling session short?